Last night I went to hear Lou Reed’s guitars and amplifiers drone away in the Cathedral of St. John The Divine in New York City. Stewart Hurwood (Lou’s former guitar technician) curated the evening and manipulated the guitars and amplifiers. The cathedral is a dark and foreboding structure on a bit of a hill “Across 110th Street” (if you’re not familiar, that’s a great Bobby Womack song). 1047 Amsterdam Ave. @ 112th Street to be precise. I took some pictures as I made my way up Morningside drive and I could hear the drones from the back of the structure. As I entered I heard a rumble of low drones accompanied by the cacophonous stabs and lurches of the church organ, which annoyed me. Obviously I had some preconceived notion as to how I wanted this thing to go. I meandered around to catch a glimpse of the guitars and amplifiers. I ended up standing behind the semi-circle of amps where Stewart Hurwood was bouncing around from amp to amp and guitar to guitar maintaining the drone and occasionally manipulating the feedback. I thought about having patience with that unexpected organ. I thought of the crowd of people. I thought about my breath. I felt like I was humming (I wasn’t). The organ had stopped and the droning continued. I felt like I was slightly swaying. I looked up and there were 2 men all in black doing a series of thai chi moves. A light applause followed which seemed weird…an unsure of itself applause over the drones. A saxophone began wailing in the distance. Stan Harrison walked around the space outside of the main circle of amps so his horn sounded in sharp relief to those of us dedicated to being near the amps intermittently and then faded back into the main hall. His playing was selective and neither overly wrought nor was it committed to a particular melody. This night was all about sound. I thought of acceptance. Accepting the organ. Accepting being in a crowd. Accepting being in my thoughts. In order to understand the idea of acceptance I had to listen. Like love. In order to love fully you must allow yourself to be loved. Like music. In order to accept music you must silence yourself and listen. I headed towards the exit and came upon Laurie Anderson playing an electric violin and a small midi keyboard and laptop. At one point she played a light recording of music that you might hear in a Chinese restaurant and I wondered if maybe it was from a place Lou and Laurie used to go. As I listened to her intuitive playing I heard Lou Reed’s guitars and amps droning in the distance and it felt like a couple calling out to each other from different rooms in the same voluminous house. I felt like I was under water. This is what it sounds like under water. 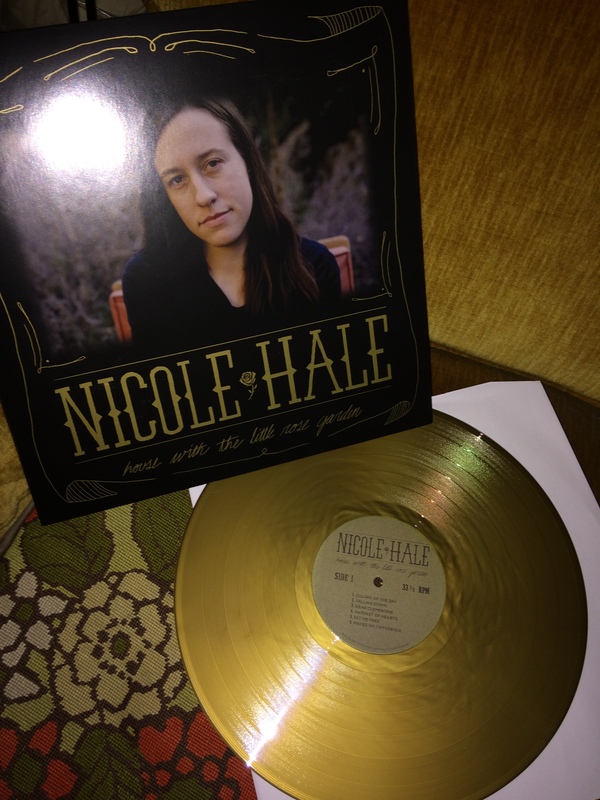 Nicole Hale, singer, pianist, guitar and accordion player extraordinaire put together and released ‘House With The Little Rose Garden’ in 2015 on glorious gold vinyl!! (available on iTunes and bandcamp, also in digital format). The album was tastefully mixed and produced by Bob Hoag at Flying Blanket Recording in Mesa, AZ. I’ve known Nicole for years. She used to host an open mic at the now defunct R Bar, 218 Bowery in NYC. Nicole has always been prolific, she once handed me a CD of rough recordings of hers which amounts to about 2 albums worth of material. I’ve always been stricken by Nicole’s voice. It’s warm and familiar i.e. immediately welcoming and yet drenched in a history. As I’ve come to learn more about her (personally) it has added a depth to my appreciation for her songs. These are mostly piano based songs, the title track and ‘Find My Way Back to You’ being the exceptions. The instrumentation (piano, keyboard, guitar, Wurlitzer on ‘Hardest of Hearts’, accordion on ‘Never Before’, bass, trumpet and sax on ‘Let Me Be’, plenty of pedal steel) and arrangements of said instrumentation are so well balanced and necessarily so as to support on one hand the deep dark songs and on the other the ethereal, amorphous songs. This is a bluesy, felt set of songs. Sad or downtempo songs have an oft unheralded power to uplift when properly crafted (as these are). Nicole manages to inhabit and report from a dark world without seeming maudlin or overly self-involved. ‘Blue Sunday Love’ knocks it out of the park in this regard. The closing track ‘Oh Water, Oh Thunder, Oh Fire’ is like an atmospheric hymn. I highly recommend ‘House With The Little Rose Garden’ for poetry and soul…2 things we all need more of in the coming years.